Japan will host Ghana in an international friendly on Sunday 1 April at the Transcosmos Stadium, Nagasaki. The friendly, sponsored by the MS&AD Insurance Group Holdings, Inc. will be presented as the MS&AD Cup 2018. This will mark the fourth year MS&AD has organised the annual women’s cup match, which will be televised live on TV Asahi. Both nations will be using the fixture to prepare for their respective continental tournaments. Ghana have automatically qualified for the 2018 Africa Women’s Cup of Nations (AWCON 2018) as hosts. Japan, the reigning Asian champions, have qualified for the AFC equivalent as well: the 2018 Asian Women’s Cup. The two continental showdowns will double as the qualifiers for the 2019 Women’s World Cup. Ghana have missed the last two World Cups while Japan have qualified for all past editions, reaching the finals in the last two. Nadeshiko went all the way in the 2011 edition, in one of the greatest Women’s World Cup finals of all time. This will Ghana’s third successive friendly against the world’s top ten, after Germany and France in 2016 and 2017 respectively. 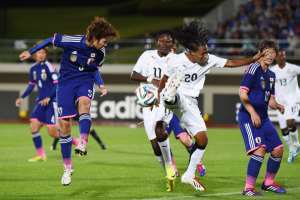 The Black Queens are ranked second in Africa while Japan are ranked ninth in the world and second in Asia. The two last met, albeit at the junior level, in the 2016 U-17 Women’s World Cup where Japan cruised to a 5–0 win.